EROICA DEA! IN TEN THE SGD SHE IS STILL THE OLD LADY. 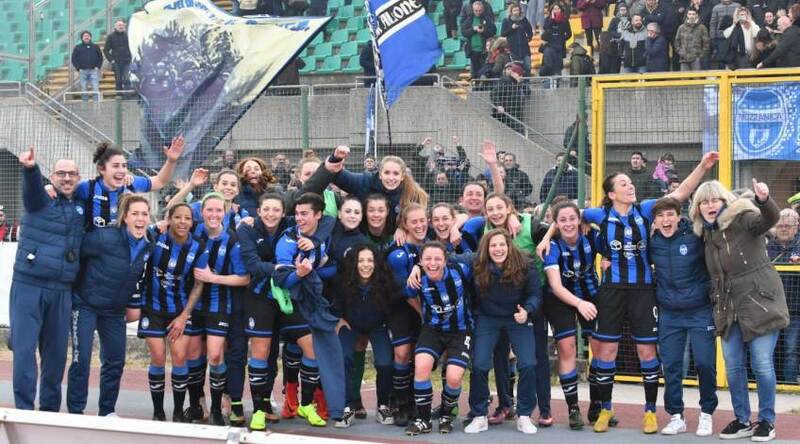 AtalantaMozzanica (4-3-3): Lemey; Lazzari, Scarpellini, Rizzon, Jordan; Colombo (39'st Pellegrinelli), Stracchi, King; Kelly, Martinovic (27'st Caccamo), Anghileri (22'T Piacezzi). Available: Salvi, Zanoli, Fusar Poli, Ghisi. Coach: Ardito. Juventus (4-3-3): Bacic; Hyyrynen, Gama, Salvai, Sikora (29'st Bragonzi); Cernoia, Pedersen, Caruso; Girelli; Aluko, Glionna. Available: Nick, Franco, Russo, Cantore, Ekroth, Panzeri. Coach: Guarino. Referee: Tommaso Zamagni from Cesena (Spanish assistants from Reggio Emilia and Panzardi from Bologna). Score: 1200 spectators. At the 16 'Scarpellini expelled (A) for handball on the goal line. At 17 'Cernoia (J), a penalty kick went wide. Ammonite Rizzon (A) and Aluko (J) for improper play. 2 '+ 5' recovery. After an incredible race, played in numerical inferiority from the first quarter of an hour until the 94 ', the Nerazzuras still stop Madama Juve and conquer with their hearts and the strength of determination a beautiful and extremely valuable point. There are over a thousand spectators at the Comunale di Caravaggio, a colorful backdrop for this challenge. Mister Ardito can not yet have Vitale, while Piacezzi starts from the bench. Contraerea still entrusted to Rizzon and Scarpellini, while the Milanese forward opts for the trident with the young Anghileri, Maegan Kelly and Martinovic. 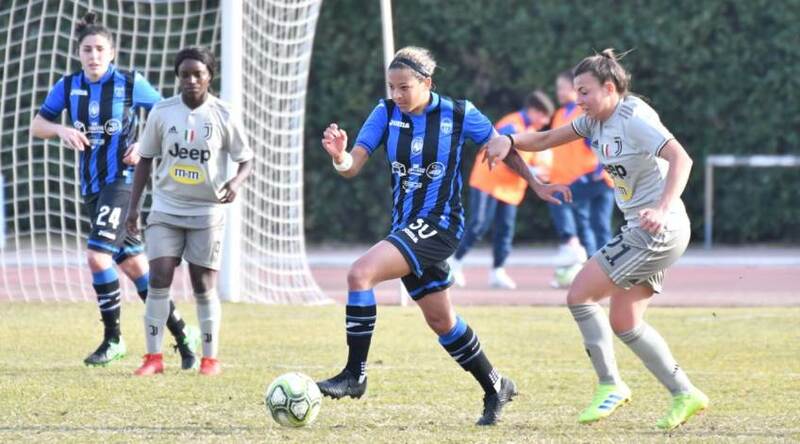 On the Bianconeri front also for Rita Guarino there is no shortage of headaches, due to the sudden absence due to a strong febrile attack by Barbara Bonansea which joins the announced ones of Giugliani, Rosucci and Sanderson. At 9 'captain Stracchi from the trocar on the set piece, puts in the area for Anghileri who misses the check, but the ball reaches Jordan, whose left is easy prey to Bacic. Three minutes later, the Nerazzurri receive a free-kick from an inviting position, but the shot by Locomotive Breathe is high above the crossbar. At the quarter of an hour the episode that will give a twist to the match. Aluko makes a door with Rizzon and conquers the ball, is presented in front of Lemey, very good in rejecting the first conclusion of the British, while on the subsequent attempt of n. 9 Juventina is Scarpellini to replace his goalkeeper, but with one arm. For the race director no doubt: it's a penalty, but the chance to take the lead is blatantly failed by Cernoia who kicks directly to the bottom from the eleven meters. Mister Ardito must already run for cover and sends Piacezzi for Anghileri in the field. Juventus is still dangerous at 22 ': Cernoia from the flag puts on Girelli's head, but Lemey's response is applause. With one more man in the field, the Bianconeri can play on the velvet and press, but they can not undermine the perched bergamasco fort. In the final minutes Lemey still says no to Aluko and goes so to rest with the partial stop on the 0-0. In the second half the music does not change, Juventus attacks and the Nerazzurri defend themselves with a drawn sword. Glionna at the 7 'imbecca Caruso, whose conclusion is off target. Glionna still at the 18 'tries to worry Lemey from football, but the Flemish flies on his left and stops and three minutes later the no. Local 1 still pushes the threat away, rejecting Aluko's tentative position with the boot. The Juventus attack does not stop and Santa Diede has to make a feline leap to lift over the crossbar the insidious head shot of Girelli. Mister Ardito puts fresh forces into the field, inside Caccamo for Martinovic at 25 '. At the 33 'Aluko, on the developments of a corner, it goes to the conclusion, but it is Colombo this time, posted on the goal line, which rejects the head. At the 38 'time comes to enter the field for Pellegrinelli who gives the change to Colombo. The Bergamo keep the barricades up to the 49 'and take a point that means momentary sixth place in solitary (Sassuolo that has to recover the internal race with Bari) and fourth consecutive useful result. The second round is giving satisfaction to Mr. Ardito and his platoon of amazing warriors who now have the most difficult task: do not lower the guard and continue on this path full of joys for their supporters.